Pearl onion/sambar Onion 4 no. 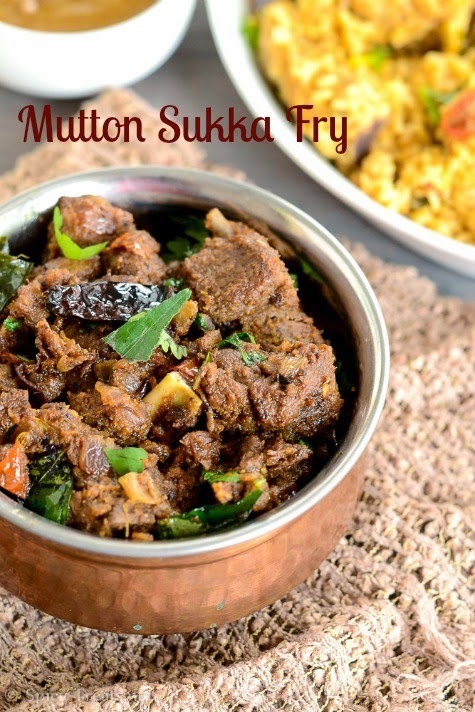 Clean mutton and sprinkle turmeric powder and keep aside. In a small mixer jar/coffee grinder, add garlic clove, ginger piece, pearl onion, cloves and pulse twice, no need to grind just pulse or pound it in mortar. Heat oil in a pressure cooker, add the crushed ginger, garlic, clove, pearl onion and saute for a minute. 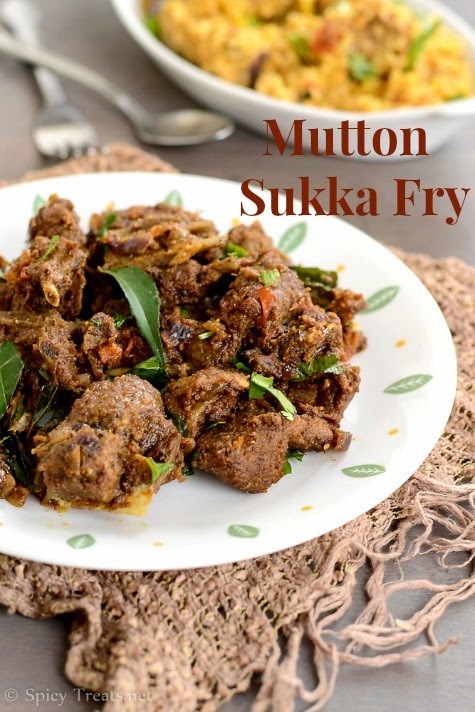 Then add mutton pieces and saute for a minute then add chilli powder and coriander powder and saute for 3-4 minutes. After that add 1/2 cup water, enough salt and pressure cook for 8-10 whistles and wait till pressure cools down. Meanwhile grind coconut and poppy seeds to a fine paste and keep aside. And chop onion, tomato and ground pepper corns and keep everything ready. 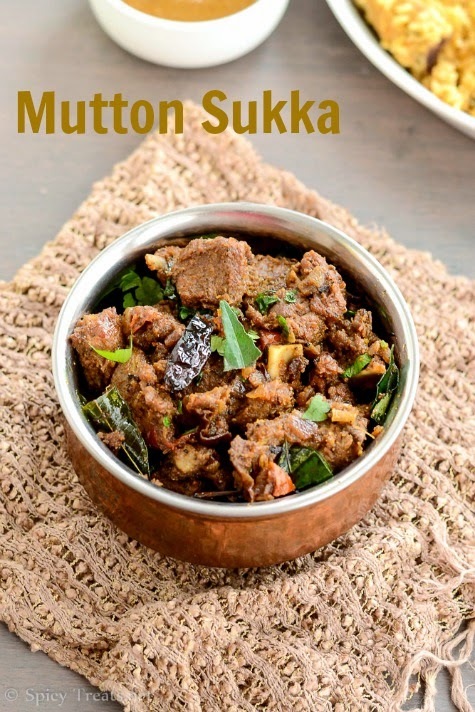 After the pressure cools down, open the cooker and check mutton is cooked soft and tender and add garam masala or mutton masala, stir well..
And then heat oil in a kadai, add fennel seeds wait till it splutter, then add dry red chilli, curry leaves and fry well. Then add chopped onions, saute till turns light golden brown followed by tomato and saute until soft and mushy. And now add the cooked mutton with little gravy(retain the remaining gravy and serve with plain rice/idli/Biryani)and stir fry in medium high heat for a minute. Then add ground coconut paste and cook covered for 2-3 minutes in medium high heat, after that remove the lid and stir fry until the moisture leaves. Lastly add ground pepper and stir fry for a minute and add some finely chopped cilantro, few curry leaves and turn off the stove. That's it..Mutton Chukka Varuval ready. 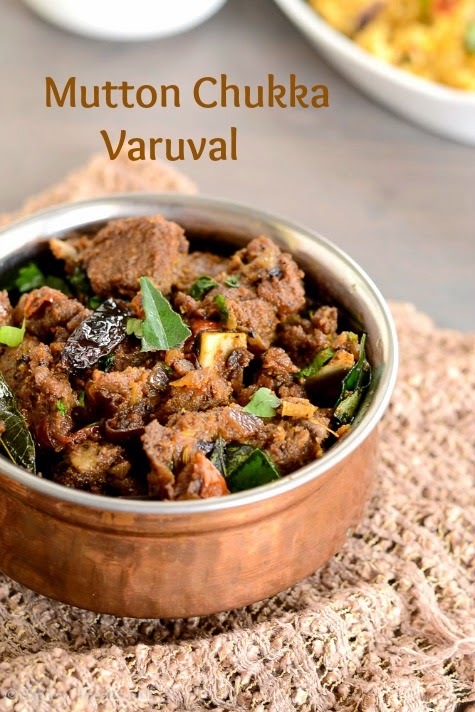 Serve Hot as an accompaniment with plain rice & Rasam Or with Biryani. If you don't have pearl onion, then add 1/4th of a medium sized red onion. You can crush ginger, garlic, onion and clove in a pestle n mortar. Do not use ginger garlic paste and it definitely alter the authentic taste. 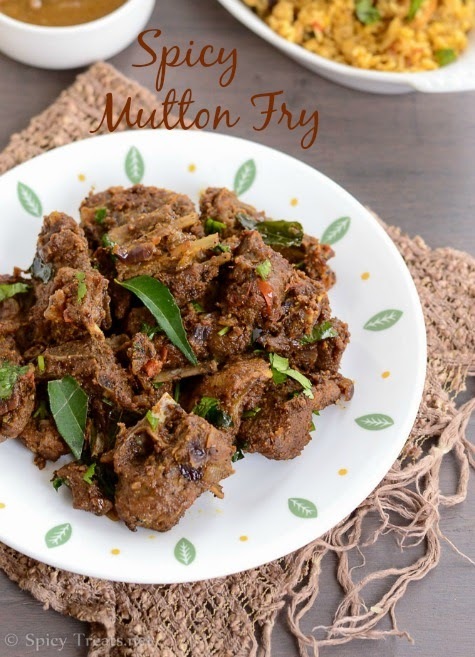 You can skip coconut and add fry well with extra ground pepper alone for a pepper mutton fry. I Used Homemade chilli, coriander powder and garam masala powder. Happy New Year Wishes To you and family ! !